Property Size 4,234 sq. ft.
*NOTE: The "Total Price" in the Instant Quote box includes your REFUNDABLE security deposit of $1000, the 9% Maine State Lodging Tax and other applicable fees. This lovely custom home sits at the end of a private road abutting wooded land. Beautiful landscaping receives guests to this pristine estate. A large foyer with gleaming wood floors welcomes you home while a large stone fireplace anchors the great room. The gourmet kitchen features high-end appliances & large center island while the 1st floor master suite is the perfect getaway. 3 more bedrooms & a large family room are found on the upper level. Ogunquit's soft, sandy beach is a short drive away. 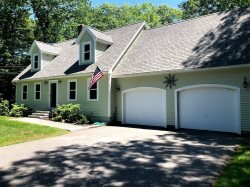 And town is closer with fine dining, quaint shops, romantic walks on Marginal Way, boat excursions from Perkin's Cove, or Golfing at the Cape Neddick Country Club. If it's biking you'd prefer, the back roads of Ogunquit are well traveled by biking groups enjoying the shade of the country lanes. Ogunquit, Maine is about 1 1/2 hours from Boston, 60 minutes to Portland, Maine, and 20 minutes to New Hampshire. This property provides beautiful setting, furnishings, and comfort. Come to Ogunquit, Maine and RELAX!